Gotta admit. I'm impressed by Punch. Maybe because I was just expecting a hokey repaint. Repugnus is sadly along the lines of what I was expecting although it's still nice to complete the trio. Why does that matter ? I am glad because I think a lot would have been comrpomised if he was (see previous Punch combiner). I agree. As cool as it would be for him to be a combiner, I'm fine with leaving it out if it means that his individual robot modes aren't compromised by the peg. I'm glad Punch isn't another pointless combiner. The car and Autobot modes both look good. And the only combiners I want moving forward are REAL ONES. Seacon's, Takara version of LioKaiser, Trainbots and Monstructor. I'd give DJD set that combines a pass (if done right) but that's it! I don't need 5 or 6 Bumblebee's merging to become Bumbleslator to singlehandedly kill Unicron. Repugnus looks completely bad. So unless it ends up with a clearance price somewhere I'll skip it. Last edited by YoungPrime on Tue Jul 10, 2018 8:48 am, edited 1 time in total. A well done to hasbro for this punch figure it seems... definitely on my Wishlist. Because I had a whole plan set up for all of the CW/UW/Potpie combiners, and Punch would have been a limb in that plan. Without him, it means I gotta do some serious reshuffling for a good number of other limb bots. Ha, ok I get it! Glad you had a plan, I gave up a long time ago. Yeah, he was gonna be a limb for Elita Infin1te. But now I can't do that, so I gotta swap out one of the CW Autobots to give to her and then replace that one for a different CW limb to give to the CW combiner(s) who would lose (a) limb(s). 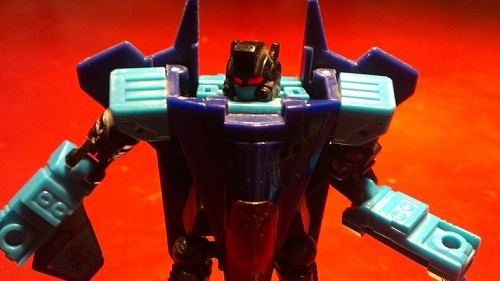 Punch/counterpunch looks great! Glad he is a new mold, and executed right too! Also, i predict this will be repainted into pointblank in the future. Before this was announced, I grabbed Combiner Counterpunch because I needed a Punch for my shelf and this was better than nothing. Still, I can pretend he's the original Counterpunch, before Punch stole his identity. 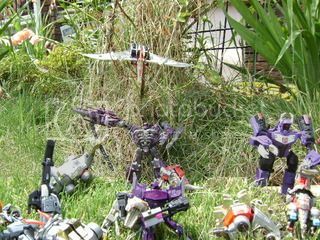 Sabrblade wrote: Because I had a whole plan set up for all of the CW/UW/Potpie combiners, and Punch would have been a limb in that plan. Without him, it means I gotta do some serious reshuffling for a good number of other limb bots. Sabrblade wrote: he was gonna be a limb for Elita Infin1te. But now I can't do that, so I gotta swap out one of the CW Autobots to give to her and then replace that one for a different CW limb to give to the CW combiner(s) who would lose (a) limb(s). Punch looks pretty good, I love the car mode especially. Repugnus is derpy but he should be- his original toy was hilariously adorable (especially considering his bio). A bit annoying that he and Grotusque are exclusives but if I can get them (and Twinferno/Doublecross) it's be awesome to have a matching trio of Monsterbots. I actually really like them all using the same base mold for some reason. The Headmaster looks a bit weak but I might try and nab the TR version for him. Repugnus has two heads to choose from and a mini me version of himself as a weapon. YoungPrime wrote: And the only combiners I want moving forward are REAL ONES. I don't need 5 or 6 Bumblebee's merging to become Bumbleslator to singlehandedly kill Unicron. Tell me more of this bumbleslator. I'm very interested. Can he only combine with other bumblebees? Do they have to be from the same continuity or do they all have to be from different continuities. Is he a multiversal agent of kid-appeal and destruction? I'm thinking his primary color should be yellow, but the chest should be black. Maybe the head should be gold and blue for a goldbug representation? This combiner is going to be awesome! Or maybe he'll be able to combine with cj, hubcap, bumper, and glyph??? Yes, and I am glad to have it. I'm a bit sad about the new one not being a combiner limb, but now that its not, I don't have to get it. It is an impressive toy to be sure, but I think in truth, its probably something that was planned for TR, but the idea of having a removable head for 2 bots was too complicated so they saved it (or perhaps a precursor to WFC?). My guess is that it may be engineered from some pre-existing TR toy, but I'll leave that for more savvy fans to figure out. In fact, the more that I think about it, it would make more sense. 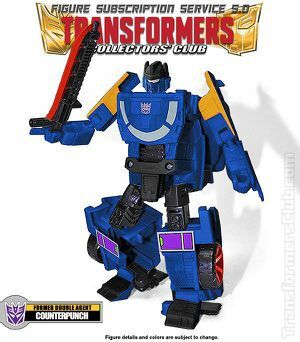 Punch/Counterpunch would have been a great way to introduce the War For Cybertron line as a SDCC exclusive, if they removed the Prime Master, there would have been no pre-existing expectations of being a combiner limb. So basically now we will have 3 Voyagers (Starscream, Elita-1 and Inferno) with 2 limbs each. 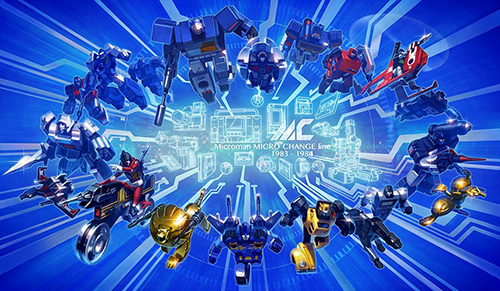 So here's to hoping that we get at least 6 deluxe limbs in WFC to finish those off, then all the other deluxes can be new original bots (we know Mirage and Impactor at least are coming) that don't have to be bound to any specific gimmick. Well I'm down for these. Especially Repugnus. I had a hunch that mold would work out just fine. At least to my own liking. Sabrblade wrote: Letdown because Punch isn't a combiner and Repugnus looks like his robot head has no paint. GOOD NEWS! There is a much better painted Repugnus head out there! Edit: Where do you guys think the TM rides in Bug-Monster mode? The head? The chest? That punch looks great, I'm really surprised it's a new mold. Though I can't help but wonder if there was plans for him within the original specs for the potp line. I'm really feeling Dead End/No Outlet Punch/Counterpunch. About the only thing I can see for remold/reuse is that it uses the Breakdown/Wheeljack wheels. Otherwise I cannot pinpoint any old mold use. That is shocking for a Special Edition. Agreed. I think many of us are still puzzling over how to complete our half-finished gestalts after these reveals. And seeing Wreck Gar against all those bright colors, I can't see attaching him to anything we have so far. Best to just set him aside till I can make a custom out of all Junkions. BUT I do have a lot of hope for finishing out combiners. The new line is supposed to be cybertronian alt modes, and that's exactly what the femmebots are. I could also see the rainmaker tetrajets being limbs for Starscream. Mind you, trying to work out that transformation accurately AND working around a big combiner port violate the laws of physics. Some wet blanket will no doubt respond and say how it's not going to happen, but I can still hope. Putting my fingers in my ears and sending mind waves to Hasbro. Surprised that Punch-Counterpunch is an original mould, I may actually try getting one now. The robot modes don't impress me that much, but I like the vehicle mode. Hopefully it's out on time for TFNation and I can get one there. 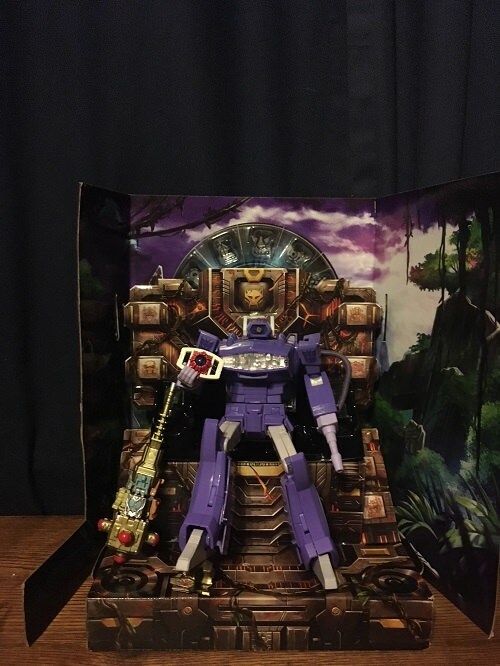 I've been contemplating getting Repugnus for a while, because Twinferno is still quite common at brick-and-mortar in my region and it looks like getting Grotusque won't be as hard as I thought, but I have no personal attachment to the Monsterbots, so I don't know if I should really bother. I'm really looking forward to both of these. Also is it just me or does the Counter-Punch mode remind anyone else of alternators Tracks? Eh. Repugnus looks pure ugly crud in both forms (one of the worst looking TF's I've ever seen). Punch looks nice in car mode but neither robot mode does it for me (but I never liked the original toy/character(s)) but hey it's not another silly combiner limb retool so there's that. And I kinda like how they even bother to switch hand colours too though still an easy pass on both of these. But yeah, starting to really scrape the bottom of the G1 barrel at this point. Last edited by Carnivius_Prime on Tue Jul 10, 2018 10:09 am, edited 2 times in total. 4,397 pages were recently viewed by 833 unique visitors. This page was viewed 1 times on Thursday, April 18th 2019 11:18am CDT. © 2019 Seibertron, Inc. DBA Seibertron.com. All Rights Reserved. Established June 2000. Seibertron.com is owned by Ryan Yzquierdo.